Bird Safe Backyard — Raptor Education Group, Inc.
Do you love birds as much as we at Raptor Education Group Inc do? Check out or "Bird Safe Backyard" page for helpful tips and tricks to invite these amazing animals into your backyard for hours of family fun. Put out the welcome mat! Attracting birds to your yard is a very rewarding and educational experience. Birds need food, water, and shelter to survive. Here are some helpful tips to help you get started. Different foods attract different birds. Let nature happen. Habitat loss is a big challenge for birds. Make your yard attractive to birds by landscaping with native plants that provide natural food sources and shelter from predators and the elements. Providing additional feeders and water is an added benefit. Provide a clean water source. Place your birdbath in the shade if possible. The water should be no deeper than 1/2 to 1 inch at the edges, sloping to 2 inches deep in the middle of the bath. Keep feeders and feeding areas clean. To help reduce the possibility of disease transmission in birds, clean feeders and feeding areas at least once a week. Plastic and metal feeders can go in the dishwasher, or be rinsed with a 10% solution of bleach and water, then rinse thoroughly. Scrub birdbaths with a brush and replace water every two days to provide clean water and discourage mosquito reproduction. Rake up and dispose of seed hulls under feeders to prevent mold and bacteria growth. Keep seed and foods dry; discard food that is wet or looks moldy. Hummingbird and oriole feeders should be cleaned every two to three days. Wash your hands after filling or cleaning feeders. Provide Shelter. Feeders and birdbaths close to natural shelter such as trees or shrubs provide resting places for birds, as well as refuge from predators. Evergreens are a perfect addition, their thick foliage buffers inclement weather and offers protection year-round. You can also provide cover for ground-dwelling birds by placing loosely stacked brush piles near your feeders. Disease. Feeding stations should be maintained properly. Disease organisms can kill birds and spread rapidly. Reduce window collisions. Windows reflect the sky or vegetation, and birds are fooled into believing they can fly through them. Birds fleeing predators are especially vulnerable to window collisions. Half of all birds that hit windows die from their injuries. Window glass kills at least 100 million birds annually in the United States. 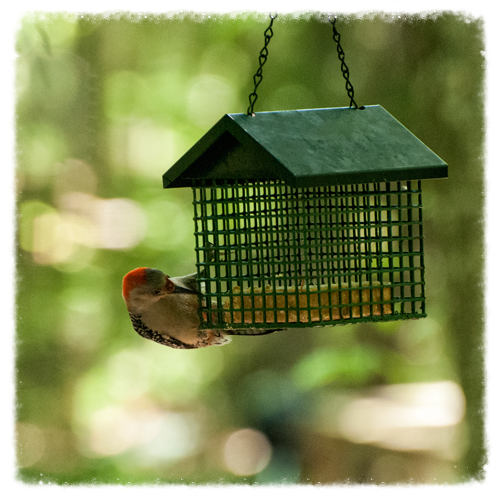 Set up your feeders in a quiet place where they are easy to see and refill. Do not place your feeders closer than 6 feet to a window. Feeders may also be affixed to a window, reducing the likelihood and severity of window collisions, as it aids in depth perception. Affixing window clings, screens, and blinds on your windows can also help. Keep cats away from birds. If you have a cat, please keep it indoors, or on a leash outside away from feeders. Birds and chemicals don’t mix. Many pesticides, herbicides and fungicides are toxic to birds; avoid using these near areas where birds feed, bathe or rest. Providing a source of clean water for drinking and bathing is an excellent way to attract wild birds to your backyard.